MAGIC INSPIRATION Yacht Charter - The "sugar scoops" are a comfortable place to prepare for snorkeling. MAGIC INSPIRATION Yacht Charter - Welcome Aboard! MAGIC INSPIRATION Yacht Charter - Float your cares away! MAGIC INSPIRATION Yacht Charter - Up with the spinnaker! Each Cabin has Queen beds with custom-made mattresses with Memory Foam Toppers. Individual A/C temperature controls - NOTE - we only run air con when the low temp for the evening is above 78 F, unless it is raining. Magic Inspiration operates a non-smoking policy. Jeffrey grew up in the quaint, New England fishing towns of Swampscott and Marblehead, Massachusetts. These picturesque seaside towns, with great beaches, fishing and diving, were his natural inspiration. Jeffrey grew up on boats, piloting his own ocean boat when he was just 12 years old. He was also an avid scuba diver, water skier and fisherman. When he was not out on the ocean, he was perfecting his many other hobbies including tennis, golf, winning many Karate trophies and the basketball state championship. Jeffrey’s lifelong passion for boating made a career in the marine industry the optimal choice. A friend offered him a position as a yacht broker in Marblehead, which lead to an executive position in the manufacture of marine equipment. After the company was sold he was welcomed back to the broker business. He worked as a sales manager and product manager for the renowned French builder, Fountaine Pajot. Based on in-depth knowledge and experience, Jeffrey knew that the Bahia model was their absolute best catamaran afloat. 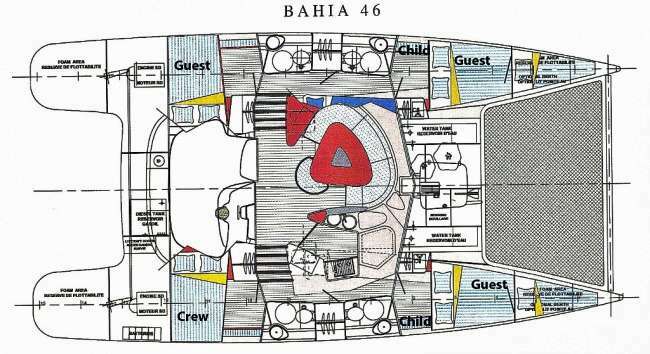 So, in 2010, when he decided to launch his own charter operation, the Bahia was the obvious choice. 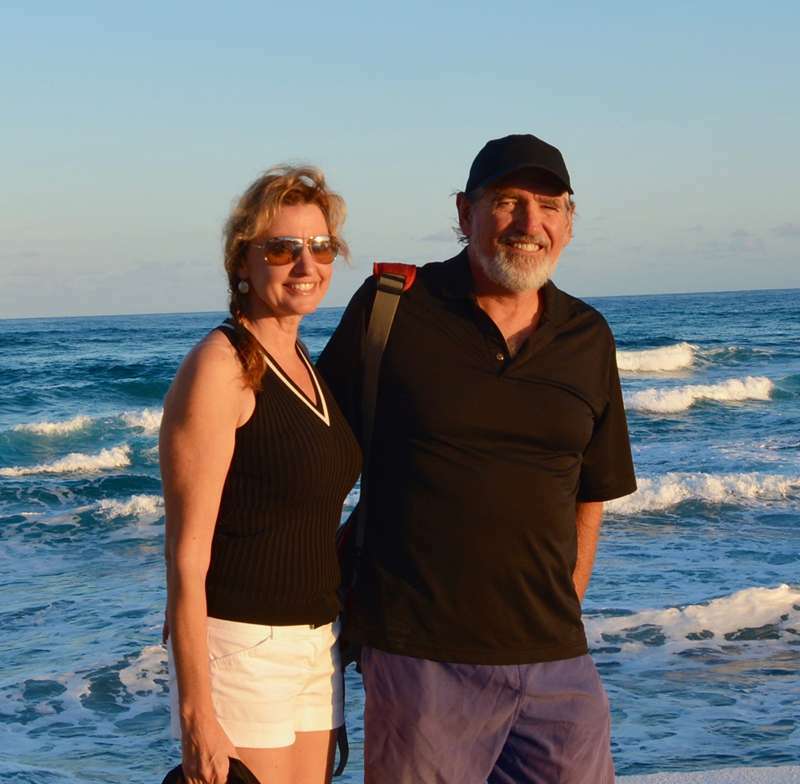 Creating a spectacular charter vacation for guests is a skill that Jeffrey has perfected. Of course, Jeffrey has the technical qualifications; a commercially endorsed MCA 200 Ton Offshore (Unlimited Passenger) RYA Yacht Master license with all the required SMTC 95 safety training certificates and BVI Captain’s license. He knows how to make even first-time sailors feel safe, comfortable and at home away from home. He enjoys sharing his passion for water sports. Whether the choice is kayaks, paddle boards, snorkeling or diving, Jeffrey assists with patience and humor. His guided tours and underwater photography are described as amazing. And when it’s time for sundowners, his amusing anecdotes and signature cocktails are the perfect ending to each extraordinary day aboard MAGIC INSPIRATION. Sandy is a small town girl from central Massachusetts. Every summer she helped her parents, brothers and sister pack up the camper and head to the shores of the Atlantic on holiday. It was a her happy, childhood introduction to the ocean. In classic New England style, the family vacation included the annual lobster feast. Sandy’s parents were both excellent cooks and she always volunteered to help out in the kitchen. In this way she learned and perfected the many wonderful recipes passed down for generations. Prior to attending Southern New Hampshire University Sandy worked as a chef in a nursing home. This taught her to prepare meals for many different dietary needs and restrictions. She graduated with a Bachelor’s in Business and went on to a successful career in high-tech marketing for global companies including Microsoft. Traveling internationally on business allowed her to add numerous recipes to her portfolio and later replicate many wonderful meals. She also completed an Oenophile course and is an expert at paring the perfect wine. Recently, Sandy has been the chef for themed summer events held at a lighthouse off the coast of Maine. She planned and prepared menus for events on Craft Beer, Knitting, Writers Workshops, and New England lighthouse history, including a weekly lobster bake on the rocky shore. This summer, she is in Alaska, managing a 104 bed Historic Inn and Seaside Lodges, welcoming guests from around the world and exploring a very beautiful state. Sandy can exquisitely prepare anything on a preference sheet, but guests aboard MAGIC INSPIRATION absolutely rave about her fish dishes, like roasted Sea Bass in lime cilantro sauce or lemon cream scallops. She also bakes fresh bread and desserts; orange chocolate bread pudding, chocolate lava cakes, coconut caramel pie, Pina colada cake, and chocolate cake with raspberry frosting. Guest needn’t worry about gaining a few pounds. Sandy leads running and hiking expeditions and yoga sessions on deck, or on the beach. She believes in being healthy while adhering to her motto: eat, drink and be merry. On board MAGIC INSPIRATION, it’s everyone’s way of life. Captain Jeff and Mate/Chef Sandy have been married for 18 years, and have been sailing for 19 total years together. Sandy's immersion into sailing was when she met Jeff in 1999. At the time he ran a sailboat brokerage business out of Cape Ann Marina in Gloucester, MA. Their journeys have taken them along the East Coast of the U.S. and to many exotic destinations such as the Bahamas, Bermuda, Dominican Republic, Puerto Rico, US, Spanish and British Virgin Islands, Jamaica, Panama, St Maarten, Anguilla, St Lucia, Bequia, Mustique, and St Vincent and the Grenadines. Their thirst for adventure, love of the sea, and impeccable hospitality combine to bring their charter guests magical vacations and memories that last a lifetime! Stereo with amplifier and adjustable outdoor speakers for those impromptu dance parties!